One of the most popular questions that I’ve gotten on Database Star over the years is how do I become a programmer/developer. In this guide, I’ll explain how to get a job as a programmer as well as offer a few tips. Getting into the role that you want in your career can be challenging. You’ll need to know what the role is, then the steps needed to get there, and then do the work. Where do you get started? How do you get the role that you want in the IT industry? The first step to getting the role that you want is to actually work out what it is that you want to do. This is easier said than done. Do you know the job title of the role that you want to do? For example, you may want to become a Senior Software Engineer at a technology company. Or, you may want to become a Database Administrator in the finance industry. If you know the job title, it helps, because we’ll use that in the next step. If you’re not sure of the job title, do you know anyone who is in the position you’d like to be in? For example, a co-worker, or someone from a book you’ve read? Write this down somewhere. You’ll use it in the next step. Once you have your job title, it’s time to pay a visit to LinkedIn. If you don’t have a profile already, I highly recommend setting one up. It’s great for your career. Assuming you have one already, log in to LinkedIn. Why are we visiting LinkedIn? Well, we’re going to use it to do research on this job title. For this example, let’s go with the title of Senior Software Engineer. Put that title into the search box at the top of the page. The results will appear. At the time of writing, there is a list of job opportunities. This is probably on purpose, but LinkedIn may change this in the future. We only want to see people. Click on the People link on the left, and the page will show people who have that title. Now, the thing to note here is that the list of people will be dependent on your connections. So, it will show people who are closely connected to you at the top of the list. It’s also dependent on their profile setup and keywords they have used, as LinkedIn tries to show you the most relevant people based on your search. So, we have a list of people with that title. Now what? The next step is to have a look at the job history of people who are currently working in that role. Well, the best way of finding out how to become a certain role is to find people who have done it before or are doing it now, and see how they got there. 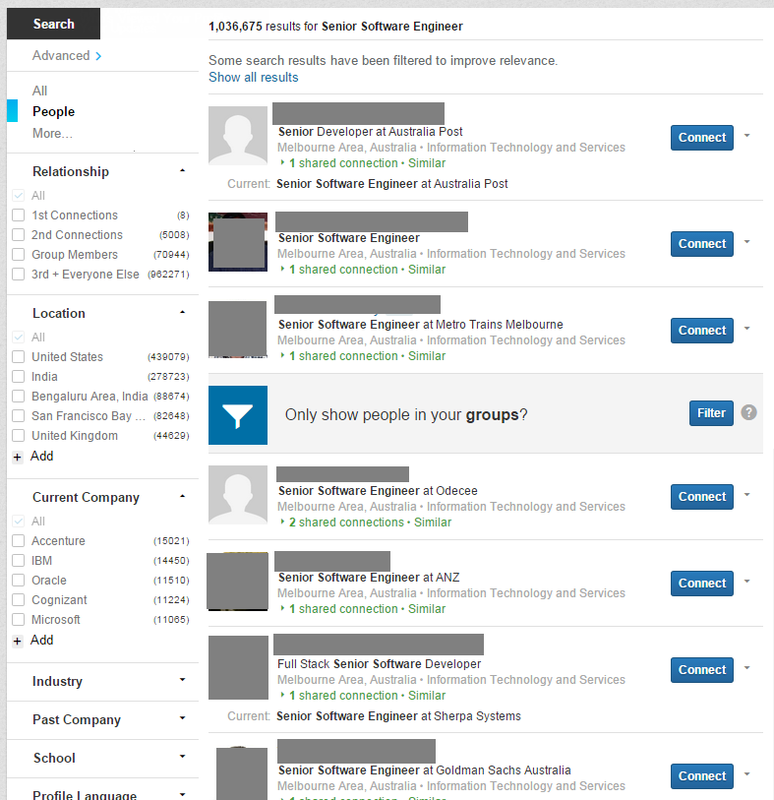 LinkedIn is a great way to find this, as people usually list their employment history in their profile. So, find a profile from the list what has the title you want and click on the name. Now, I’ve blocked out some of the details of this profile to maintain the privacy of the person in question, but you should be able to get the general picture. 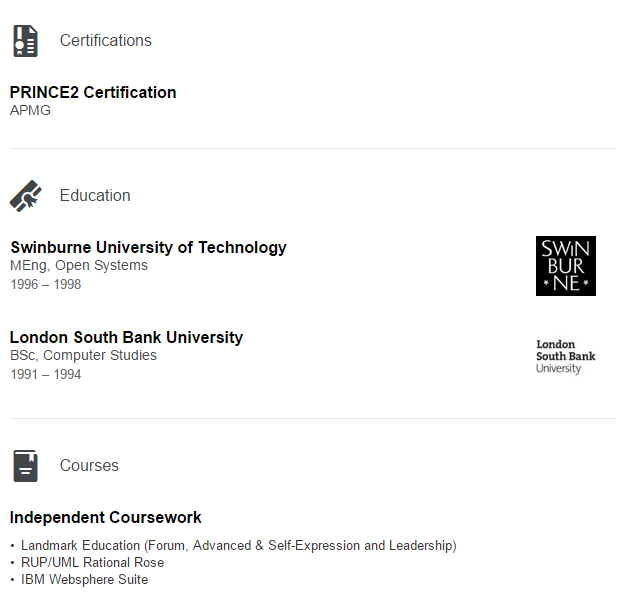 This summary section will show an overview of the person, which usually includes their qualifications and experience. However, for most profiles, it’s too broad to use for this research. Scroll down below that and have a look at the section titled Experience. You can see, in this example, that the person currently works as a Senior Software Engineer, because the date says “August 2010 – Present”. They have been in this role for almost 5 years at this company. You can also see what kind of work is involved and usually a little bit about the company. However, to find out what you need, keep scrolling down. There should be more entries in this Experience section for this person. LinkedIn profiles, unlike resumes, don’t have a limit on experiences, so you should see all of their roles here. Sure enough, scrolling to the bottom will see this person’s first role. This will show how they got started in this industry. What do you need to do with this information? Make a list of their roles and dates. This helps with working out how to get where you want to be, and how long it takes. Both of these are easily visible in the profile. But, that’s not all you’ll need. You also need the Education part. Experience is one thing. Another factor to consider is education. Keep scrolling down in the profile you’re looking at until you see the Education section. This is important, as it shows you how the person got started in their first role. As you can see, this person has a Bachelor in Computer Studies from a university, then went on to get a Masters in Engineering. They also did some independent coursework and got a PRINCE2 foundation (which is in the Project Management field). This will show what extra things you need to get into this role. Alright, so you’ve got the information from one profile. Now what? One result is not a definitive guide to getting the role you want. You should go back to the search results, choose someone else from the list, and repeat the same task. How many times should you do this? Well, as many as you can until you understand what needs to be done to become this role. As an indication, I would probably get information from 10 different profiles if I was doing this myself. If you have a large list of people or are looking for a particular kind of role, you can use filters. There are filters on the left that let you filter by your relationship, location, company, industry, and more. I would suggest filtering by country, as different countries may have different requirements. You may also want to filter by company or industry if you’re looking for those in particular. The research for each person should take about 10 minutes. Before long, you’ll have a pretty good list of different profiles. Once you have a list of people in the role that you want, as well as their history, you should now combine the data. By this, I don’t mean add them all into a long list. I mean, create some kind of summary that shows the most popular route to getting into that role. For example, let’s say you have information on 10 people. Let’s start with Education. 7 of the 10 got a Bachelor’s degree, 1 has a master’s, and the other 2 didn’t have anything. You could then write down that the education requirement is to get a Bachelor’s degree. The next step is their first role. Let’s say 6 of them started as a junior software developer, 1 in help desk, 1 as a software engineer, and 1 as a web designer. You should pick the majority here, and note that the first role is a junior software developer. How long did they stay a junior software developer? Find the most common answer here as well. Let’s say it’s 3.5 years – so write that down. Don’t forget to include the next jobs, as some people move to a different company in the same role, which comes up as two entries on their LinkedIn profile. Keep going until you get a complete picture of the path to the role you want. From this information, you can see the education needed, the job roles on the way to that role, and the time spent in each role. 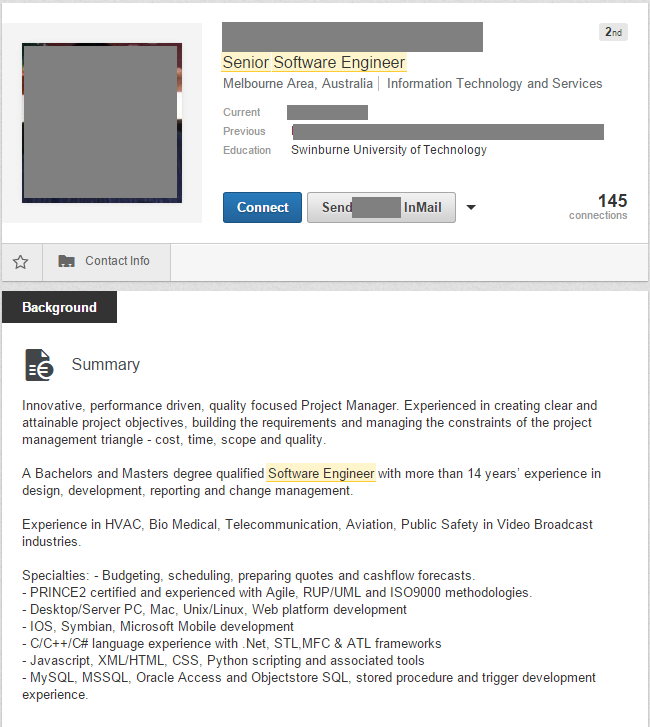 In this example, it shows you need a Bachelor’s degree and 10.5 years experience to become a Senior Software Engineer. LinkedIn is one of my favourite websites for finding jobs. It fits the category of “powerful”, as there are a lot of ways to find jobs, and it’s quite effective. They have a built-in job search section, which works in a similar way to other job websites, where you can search by keyword and area. This can be easy to use and can be quite effective as there are jobs here that aren’t offered elsewhere. LinkedIn also uses advertising to make revenue. Some users can find this irritating, while I actually find it useful as it’s well-targeted. Ads appear in the sidebar for other companies and jobs that are available. They often link to your skills in your profile, so if you’re a .NET programmer, you’ll see mostly .NET development jobs. Action: Sign up to LinkedIn if you’re not already on it. If you are, make sure your profile is up to date. This is probably the most common method to find programming jobs, and it’s probably something you’ve already tried. I think it’s still a good place to find jobs. There are many sites out there, and most of them work in a similar way. You enter your keywords, location, and other criteria, and a list of results are displayed. The results contain details about specific job postings by companies (or recruitment agencies), and allow you to apply on the spot. Many job websites allow you to create a profile and upload a resume for searching by companies. Others allow you to email a copy of your resume to a contact or into a system. Both methods are a good way to find programming jobs. Some of my favourite job websites are Dice, Indeed and Simply Hired. Action: Search some popular job websites for a role and location that fit your criteria. Twitter is a useful and an under-utilised method to find programming jobs. There are many uses for Twitter besides following celebrity gossip and news feeds. Many companies create Twitter accounts to post job advertisements, either as the company themselves, or dedicated accounts for sharing various jobs. I’ve followed a few accounts on Twitter that do this, such as IntellegoJobs, London IT Jobs, and Jobs Australia. The great thing about Twitter is that it’s easy to connect with others in the industry. You may be able to speak to someone in the recruiting area directly, or someone else from the company on Twitter, which is easier than sending an email or a phone call. Action: Search on Twitter for some keywords you want to find (such as “programming jobs Colorado”) and you should find some relevant users to follow. Most companies that offer programming jobs or software development have their own website. Actually, I would think it’s strange if they didn’t have one, whether they are a large or a small company. Depending on how they’ve set it up, they should have a page that lets visitors know how they can apply for a job at the company. This could be a “Work For Us”, “Apply” or “Careers” page, or something to that effect. Sometimes companies don’t advertise the positions they have externally. Perhaps they don’t want to spend the money to run advertisements, or perhaps they are not actively looking, or they don’t have time to look through the large number of applications that they might get from an advertisement on Monster.com. Putting up a job application page on their website is a passive way to attract talent to their company. Action: List a few of the companies you’d like to work for and look on their websites to see if they have a Careers page. “Jobs on Facebook?” I hear you ask. Isn’t it just for looking at your friends’ photos and seeing what they did for their day? Well, yes, but it can be used for much more than that. Facebook is the largest social network on the Internet, and it can be used to find a job. 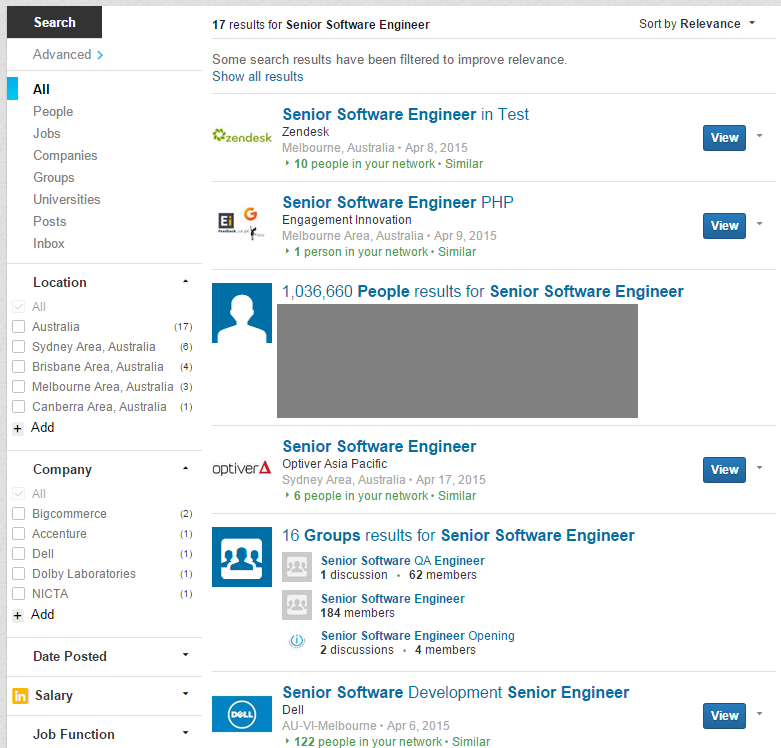 Similar to LinkedIn, it runs advertisements on the sidebar (and other places recently) for many things, including jobs. It’s quite targeted, so you should see things that match your profile. It’s not always job-related, but you do see some job ads there, which might meet your criteria when looking for a job. The website also allows companies to create pages, to help promote their brand or communicate with customers. One of the things these company pages are used for is promoting job openings. If you follow some company pages, you can get an idea of jobs that appear. Like Twitter, you have a more direct line of communication with those inside the company with these jobs. Action: Follow some company pages on Facebook and keep an eye out for job openings posted by them, or advertisements when using Facebook. One of the most common ways to find programming jobs, and in IT in general, is through people you already know. If you’ve been working in IT for some time, you are bound to have met some people in the industry, whether this is within your company or people you’ve worked with from other companies. In the long term, building up a relationship with them can be helpful to your career. If you’re looking for a job right now, you can get in touch with them to see if any are available, or just to let them know you’re looking. You can do this via social websites such as LinkedIn or Facebook, or you can do it the “old-fashioned” way and use the phone and email. Getting in contact with people you know in the industry is a great way to improve your career – whether you’re looking for a job or not. If you haven’t yet had a job in the industry (if you’re a recent IT graduate, for example), you should be able to contact those you went to college or university with. Action: Get in contact with a few people you know in the IT industry and mention you’re open to new opportunities and programming roles. There is a community for almost anything on the Internet, from fitness junkies to Rolling Stones fans. As IT professionals, we use the Internet more than the average person, and there is no shortage of communities for us out there. Forums, discussion groups, and other blogs are a great way to meet and converse with other IT professionals on a range of interests. StackOverflow, for example, is a popular question and answer and discussion site for coding problems for programmers. With a community comes an opportunity to help others. A good way of helping others is to offer jobs. This is related to the use of your contacts tip from above, but it’s more than that. Meeting new people in the community is great, and it’s one of the main purposes to them. Discussing issues in the IT world is also a common theme. The jobs to be found on these sites are often from job advertisements but are also available from meeting and speaking to others in the forum. If you’re known as someone who is helpful and knowledgeable, others will realise this. Twitter is one of the most important and most popular social networking sites. It can also be used for finding a job in the IT industry. Your Twitter profile is identified by your username, or handle. This is referred to using the @ symbol. The username must be unique, as it’s used in tweets and to log in to your account. When you sign up to Twitter, you need to choose a username that isn’t already taken. However, what a lot of people don’t realise, is that your display name doesn’t need to be unique. This is what is shown primarily when people view your profile page or your profile in the Twitter feed. This should ideally be set to your first and last name. It’s more professional, it allows people to see who you are, and it helps potential employers find you. You have a small section on your profile to add in your biography. This section allows for 180 characters to explain who you are and what skills you have. Hashtags are a great feature on Twitter. They allow you to tag and group conversations and tweets, to make it easier to find by others. For example, to search for tweets tagged as “programming” you would type in “#programming”. You may get suggestions, which are common tags that are being used. Select one, or select the tag you entered. The results for this tag will be displayed. You can browse through them to find people and companies to follow. Another way to keep informed about the IT industry and any jobs that may be going is to follow companies in the industry. Many companies, such as IBM, Accenture, and Microsoft, have Twitter accounts. Follow them on Twitter to get an update on their company, including any posts about recruitment. You should follow smaller companies too, and not just the giants. Search for a few keywords of hashtags related to companies in your area to get a list of companies you can follow. Some Twitter pages, such as @IBMUKcareers, are specific to Career opportunities for a company (such as IBM). There are many sites available to help you find followers in a different way than using the Search feature in Twitter. Twellow is one of those sites. Twellow allows you to search for top followers, which are grouped into many categories. If I go to the Computers and Technology category, I can see individual Twitter users, as well as more subcategories. Search through the categories and subcategories until you find the kind of users you’re looking for, and follow them on Twitter. The more focused your tag is, the narrower the results. If you click on Save on the top right of the search, it will appear in the Saved Searches when you click on the Search bar in the future, which saves you time. The aim of Twitter is to be able to connect with other people from around the world. We do this by using tweets – short messages sent out to our followers. To get the most out of Twitter, you should be providing these short tweets to your followers. It’s kind of like a Facebook status update, but not as long. Send out some tweets every now and then (but don’t spam people). Remember, recruiters may be looking at your Twitter profile. Try to make your tweets both helpful and positive. You can share things you’ve discovered in the IT industry, recent news articles, or advice that has been written in articles. A lot of my tweets are either sharing the blog posts that I write, other pieces of advice, and things I’ve noticed during my workday. Another way to provide value to other users is to retweet. Retweeting is just the word for sharing someone else’s tweet. You click on a button labelled Retweet, and the tweet is then sent to your followers as well. The person who wrote the tweet is then notified that you did this, which they will appreciate. Doing these things on Twitter will help you get noticed, and your followers will appreciate it more. Conversations are happening all the time on Twitter. They are started by someone tweeting, and then someone else replies to that tweet, and then the original person replies, and it goes from there. Most of the time, these conversations are in the public. They are replying to each other, but everyone can see. It’s kind of like two people talking using the Reply All feature, but less annoying! You can join in these conversations quite freely. As long as you’re adding value, and not insulting anyone, it should be quite effective. Join in the conversation by pressing the Reply button to one of the tweets. Their username will appear, and you can add your comments afterwards. I can now have a conversation with this person. This is a great way to reach out to others in the industry. The website TweetMyJobs is kind of like a job board, but with a twist. It’s based on Twitter, which means you can link it to your Twitter account. You’ll now receive a tweet each time a new job for this area is available. You can also click Search to see any results that appear. As you may have noticed, Twitter can be a bit overwhelming at times, especially with the constant stream of tweets being sent. There is a way around this, though. You can create “lists”. A list is a saved group of Twitter users that you can set up. Rather than seeing your page filled with tweets from all of your followers, you can create lists to see certain segments of them. For example, you might create a list of consulting companies that you follow, so you can stay up to date on consulting news. Your lists will appear here. Click “Create new list” on the right. Select whether you want your list public or private. The list now appears on the Lists page. Click on the lists page and you can see tweets from users on that list. A great place to store your resume is Dropbox. It’s backed up, available anywhere, and can easily be shared. Your resume is the main document you will need when looking for a job. It should be easily available for you to view and share with others. It can also be shared on Twitter by using two methods: Dropbox, and URL shorteners. A URL shortener gets a long URL and translates it into a shorter URL. This is helpful for Twitter because of the 140 character limit. Put your resume in your Dropbox Public folder. Go to a URL shortener website. My favourite is Bit.ly, which you can find at https://bit.ly. Your shortened URL will be created. In this case, the URL is https://bit.ly/1rCP0oq. Click Copy to copy the URL to your clipboard for using anywhere you like. This URL will then redirect to the file you put on Dropbox – and is a much shorter link! This is great for sharing your resume link with recruiters and other people on Twitter. Should I Work for a Large or Small Company? One of the most common questions about working in the IT industry is around the kind of company that we should work for. Should you work for a bigger company, or a smaller company? Large, multiple-location corporation, or small, growing business? Let’s take a look at the advantages and disadvantages of each. There is no right answer to this question – they each have their pros and cons. It really depends on your circumstances and what you want out of your career – experience, promotions, travel opportunities, security, benefits. These points I’ve listed below are just general points – individual companies may not match to these points exactly. Let’s have a look at the specific reasons. Your responsibilities are varied. At a smaller company, you are likely to be in a position where you have a few different responsibilities. This is usually because they don’t have people dedicated to take care of certain areas. You may be in charge of desktop support and website development – traditionally two different roles. In other companies, you might be in charge of quality control as well as a developer on another team. It really depends on the company. There is a larger selection of companies. This is purely based on the number of companies, but there are a lot more smaller companies out there than larger companies. This means there are more places for you to work as you’re not limited to just a few companies. You are closer to upper management. Working for a smaller company means you’re likely closer to the senior managers or owners of a company. This is good as it gets you on their radar, and you can feel like you have more input into the decision making process. Your success is noticed. As it’s a smaller company, any good work you do is noticed by others from around the company. This isn’t always the case with the larger companies. It means you’ll get better recognition and perhaps even rewarded, as it’s more likely to be noticed. Better working conditions (usually). It’s safe to assume that smaller companies have more relaxed working conditions. I say this as a generalisation – there are some big companies with good environments (such as Google) and smaller companies with bad environments. It’s just easier for smaller companies to have different conditions as they don’t have a larger staff base to support and can make changes easier. It’s not all good news though – there are some disadvantages of working for a smaller company. Your failures are noticed. The opposite of the point above about successes, working in a smaller company also means that your failures are noticed. If you make a mistake, then it’s more visible to the team and the company. The benefits package is smaller. Smaller companies tend to have less revenue, which usually means they’re not able to provide the same kind of benefits as larger companies. Car leasing, dental care and health care are some of the benefits that larger companies provide more often than smaller companies. There may be no HR department. In larger companies, a human resources department takes care of all matters relating to work conditions and their staff. In smaller companies, there may not be enough people to warrant a separate HR department, so this role may be left up to a senior manager or the owner. The other choice is working for a larger company, which has its own set of pros and cons. There is a clearer structure for promotion. Larger companies are usually more structured in their organisational chart and career path, so promotions and staff movements are clearer. It’s usually quite well defined where your career options are. More jobs available at big companies. Larger companies tend to have more job openings than smaller companies, so you have a better chance at a particular company. If you’re dedicated to becoming an engineer in Cisco, for example, they are likely to have many positions open for this kind of role. Easier to specialise into a role. At a big company, it’s easier to become specialised in a certain kind of role, using the experience and knowledge you’ve gained. If you’re a project manager, you might wish to specialise in large projects involving internal, web-based systems, or projects involving critical financial systems. This can help your career if it’s something you’re interested in. Easier to move jobs without leaving. In a larger company, a common career move is to shift into a different role within the same company. This can give you new experiences without having to go through the full job application and interview process. The benefits package is usually better. Larger companies tend to offer bigger and better benefits packages, as they are competing with each other for the best talent. They also have more money to spend on these areas, so if this is important to you, a larger company may be the way to go. There are, however, some disadvantages in working for a larger company. Job changes and promotions can happen slower. Unlike a smaller company, working at a bigger company usually means you need to work your way up slowly into the position you want. Promotions tend to happen slower and there is usually more competition for positions. You may not know a lot of your coworkers. The nature of larger companies means that you might not even know a lot of your coworkers. Knowing them by name may be all you get – you might even get to speak to them on the phone, but knowing them in person is easier in smaller companies. There is a danger of getting “typecast” or “pigeonholed”. This is the negative aspect of being specialised. It can be easy to get linked to a specific role skillset if you do it for long enough at a company, which means it’s harder to move on. It can prevent you from getting different roles or promotions too, as you’re seen as being too valuable in one position. Changes happen slower in the company. Larger companies tend to have a longer approval process and decision-making process, which means any changes and suggestions tend to take longer to happen. This can be frustrating for some of us IT workers. Well, I hope this guide has been helpful if you’re trying to work out where your career is going and how to find the path to your ideal job. If you have a long-term career plan, it’s one step you should be doing. If you don’t have a long-term career plan, make one! Readers, what is your ideal role? What would it take for you to get there? How did you go with this process? Reply in the comments section below. Career Action Tip: Perform this process for the job role that you want in your IT career.